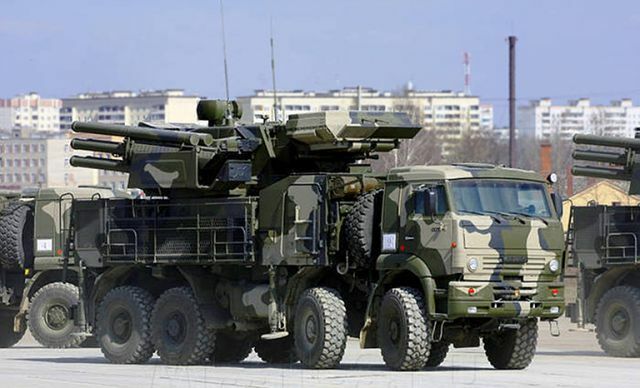 Brazil and Russia could sign a contract on the delivery of Russian Pantsir-S1 air defense systems to the Latin American country as early as in the first half of 2015, Brazilian Ambassador to Russia Antonio José Vallim Guerreiro said on Wednesday, January 28. “We hope very much that the contract will be signed this semester because the discussions are very advanced… Signing the contract is going to be a very important achievement,” Guerreiro said in an exclusive interview with RIA Novosti. The potential arms purchase by Brazil, which includes three Pantsir-S1 batteries of up to 18 units, is estimated at $1 billion, according to Russia's Kommersant business daily. The Pantsir-S1, produced by Russia's KBP, is a short-to-medium gun-missile system combining a wheeled vehicle mounting a fire-control radar and electro-optical sensor, two 30-mm cannons and up to 12 57E6 radio-command guided short-range missiles. The system is designed to destroy a variety of airborne targets at altitudes from 5 meters (16.4 feet) to 10 kilometers (32,800 ft) at a range of 200 meters (656 ft) to 20 kilometers (65,617 ft). Following the Russian delegation's December 2014 visit to Brazil, Moscow offered Brasilia active cooperation in high-tech areas, including space, shipbuilding and aviation. A series of defense equipment and air defense system sales is also expected to be signed. The Stockholm International Peace Research Institute's (SIPRI) December 2014 report revealed that contrary to global declines in arms sales, Russian arms trade has seen an uptick in comparison to 2013. According to SIPRI, Russian shipments in 2014 accounted for 27 percent of global arms exports. In July 2014, Russian President Vladimir Putin said that foreign orders have grown to nearly $50 billion from $35 billion earlier in the year.